Who's Making Love (Johnnie Taylor) / I Like Everything About You (Jimmy Hughes) / Hang Em High (Booker T. & The MG's) / Where Do I Go (Carla Thomas) / I've Never Found A Girl (To Love Me Like You Do) (Eddie Floyd )/ Smell Of Incense (Southwest F.O.B.) / Cold Feet (Albert King) / Soul Limbo (Booker T. & The MG's) / So Nice (The Mad Lads)/Bring It On Home To Me (Eddie Floyd) / Private Number (William Bell & Judy Clay) / Long Walk To D.C. (The Staple Singers) / I've Got A Sure Thing (Ollie & The Nightingales / Copy Kat (The Bar-Kays) Soul Clap '69 (Booker T. & The MG's) / Hear My Call (The Staple Singers) / Save Your Love For Me (Johnnie Taylor)/Peeped Around Yonders Bend (Jimmy Hughes) / Book Of Love (Carla Thomas) / These Old Memories (The Mad Lads)/Mercy Mercy Mercy (Southwest F.O.B.) / Hot Hips (The Bar-Kays) / Heartaches Mountain (Ollie & The Nightingales) / Twenty Years From Today (Johnnie Taylor) / It's Wrong To Be Loving You (Eddie Floyd) / It's Me (Judy Clay) / Booker's Theme (Booker T. & The MG's / Left Hand Woman (Get Right With Me) (Albert King). This double LP (USA) was issued in early 1969 as a kind of Stax and subsidiaries (Volt and Hip) but also includes on the second LP several tracks unavailable on other Stax records. 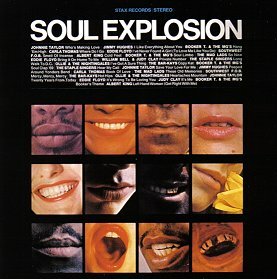 They are as follows: Hear My Call - The Staple Singers featuring Mavis Staples, Book Of Love - Carla Thomas, Hot Hips - The Bar-Kays, Heartache Mountain - Ollie & The Nightingales, It's Wrong To Be Loving You - Eddie Floyd and Booker's Theme - Booker T. & The MG's, this version is the original one. The booklet is in both Japanaese and English and lists the song lyrics. Well worth seeking out if only for the unavailable tracks. This CD has been issued in Japan on Soul Walker 3 Victor VICP-62930 in January 2005.